I first saw this video about a week ago, and I instantly fell in love with it. Why? 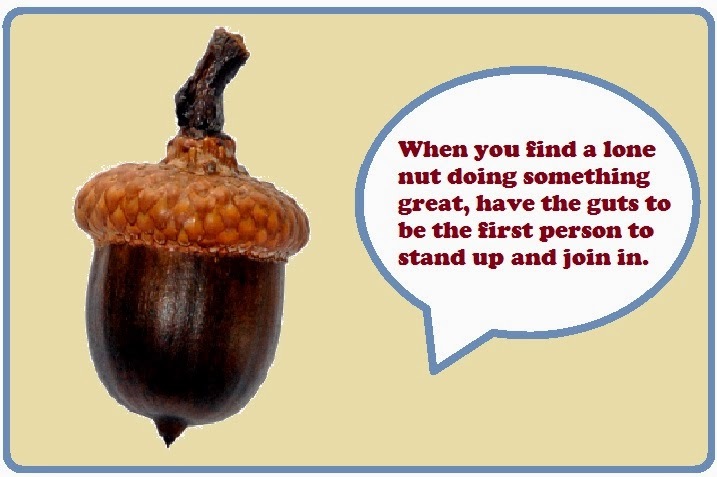 I often feel like I am the lone nut. With my groups, I try to help them discover their leadership skills; I find that I am trying to inspire them to be my first followers. My lesson today started with a discussion about how October is Bully Prevention Month. I played the groups this video, and afterwards I did my own little dance and told the kids I was the lone nut. I asked them to be my first followers. Although I am not looking for a first follower to transform me into a leader, I am looking for a first follower to start the momentum and create a movement. What is their "spark that will start the fire"? What can they do to make others "courageously follow" them? What "guts" will they show to be "the first person to stand up and join in?" What do you think of this video? Do you have other video clips that you use with students to help them understand the concept of leading? Let me know. I showed this to my girls group today. Before, we discussed the differences and similarities between being popular and being a leader. I then wanted them fill out a Declaration of Intention found on Pinterest, but the bell rang. Thanks for sharing!